All Winter, Spring, Summer and Fall 2019 graduates are invited to participate! All of our graduates are asked to complete a short exit interview survey that lets us know whether you plan to walk in the department ceremony and includes a few questions about your post graduate plans. Click here to fill out the survey by April 26, 2019. Monday, June 17, 2019, at 4:00PM in the Willamette Hall Atrium. The Chemistry and Biochemistry faculty and staff invite graduates and their guests to attend the department’s graduation ceremony and reception. Tickets are not required for the department ceremony. Graduates may bring as many guests as they wish. The department ceremony is for both undergraduate and graduate majors. Graduating students will be individually recognized on stage as they receive their diploma. The ceremony will be approximately one and a half hours long, and a reception with refreshments will follow. Graduates should gather in room 107 Klamath on graduation day at 3:45 PM. You will be given instructions and handouts for the ceremony and photographer. Tickets are Required for University Commencement Ceremony. Due to limited capacity, tickets will be required for guests attending the university ceremony. Information regarding claiming tickets will be sent to students’ "@uoregon.edu" email and will be posted on the commencement website closer to the ceremony date. Visit commencement.uoregon.edu for full details. 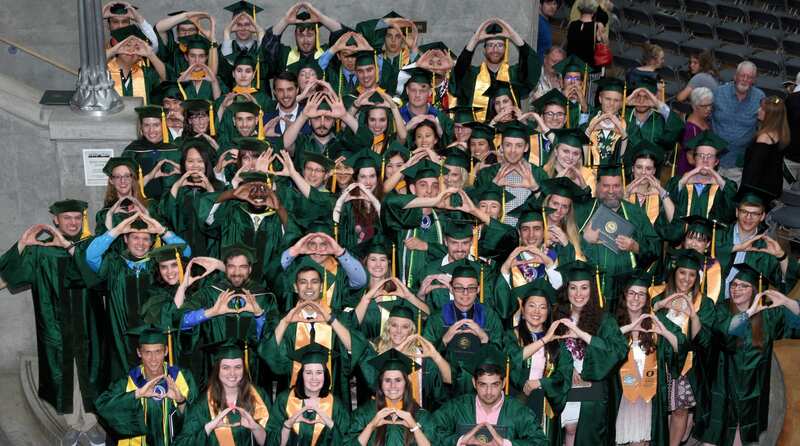 Senior Send-Off Thursday, June 6, 2019, 11am – 2pm at the EMU Amphitheater Save the date for the annual Senior Send-Off event hosted by the UO Alumni Association, just for our graduatingDucks. Connect with other graduates and alumni while enjoying your traditional root beer float, commemorative pintglass, and other giveaways. All graduating students are welcome to attend. Invitations and regalia (cap, gown, and tassel) can be ordered from the University of Oregon Duck Store. Grad Fair at the Duck Store offers an opportunity to get all of your graduation needs taken care of in one place and at the same time, and take advantage of special Grad Fair discounts and incentives! Graduates and their guests are strongly encouraged to take advantage of free parking at Autzen Stadium and the free shuttle service to reach campus – see Parking and Shuttle Information on the UO Commencement website. Guests should plan to arrive at the parking lot at least an hour before the start of any ceremony they wish to attend to ensure enough time to reach their ceremony site. If you or members of your family need disability-related accommodations for the ceremony, such as accessible seating/parking or sign language interpreters, please contact Leah O'Brien, (541) 346-4839 or leaho@uoregon.edu, by Monday, June 3, 2019. Any requests made after that date may not be able to be accommodated.